Luxury Small Group Journeys are the ultimate small-group travel experience, featuring an in-depth itinerary, best-in-class accommodations and an A&K Tour Director, with no more than 18 guests (24 on Family Journeys). 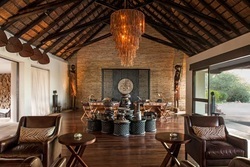 Enjoy Africa from the comfort of a secluded, eco-friendly lodge on a Luxury Lodge departure. 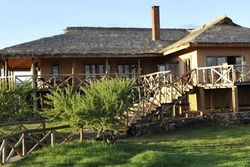 Enjoy six nights in the heart of the Great Migration - three in Kenya and three in Tanzania. Experience Africa's astounding diversity with A&K's expert driver-guides in our own custom-made vehicles. Enrich your journey with a private visit to Amboseli Elephant Research Project, as well as a meeting with a Maasai elder to learn about local culture and traditions. Arrive in Nairobi and check in to your accommodations. Drive to Amboseli National Park at the base of soaring, snowcapped Mount Kilimanjaro. Set out in search of its spectacular wildlife — African savannah elephants, leopards, cheetahs and hosts of plains game — all roaming freely amid swamps, springs and a shimmering, dried lakebed. This evening, gather with fellow guests for a welcome dinner. Spend a full day exploring wildlife-rich Amboseli National Park, keeping watch for mighty lions and buffalo during morning and afternoon game drives. After lunch, visit the Amboseli Elephant Research Project to learn about elephant family structure, life cycle and behavior. Drive to the Tanzania border, continuing to Lake Manyara National Park. In diverse Lake Manyara, see elephants shaded by baobab trees, prolific birdlife and monkeys, who playfully scamper through the groundwater forest. Spend a full day exploring Lake Manyara National Park, backdropped by the spectacular, rust-hued Great Rift Valley. In the former, look beyond the floodplain to acacia woodlands, favored by resident tree-climbing lions. At the latter awaits a stunning concentration of animals — mobs of elephants and impalas and zebras — all of which traverse the plains until the river calls. Look, too, for pythons and the twitching tails of leopards, who hide high above in sausage trees. 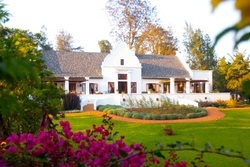 Travel overland to your elegant Cape Dutch-style lodge, set within an Arabica coffee estate, or your exclusive mobile tented camp, nestled amid wildlife-populated grasslands of the Ngorongoro Crater, an ancient volcanic caldera. Set out on a full-day game drive to explore the panoramic, short-grass prairies along the crater floor, home to rare black rhinos as well as lions, hyenas and gazelles. See vibrant flamingos mirrored in shallow waters and a near-endless procession of other winged wonders, all coexisting with colorfully garbed Maasai herdsmen, who call the stunning landscape home. This afternoon, visit a Maasai village and meet with an elder to learn about local culture and traditions. Drive to Serengeti National Park, pausing for a privately guided visit at archaeologically rich Olduvai Gorge en route. The vast Tanzanian landscape hosts one of earth’s last remaining wildlife spectacles: the annual Great Migration, when a staggering number of herbivores trek across the Serengeti plains in search of water and fresh grass, hungry predators following in their wake. Over the next two days, your adventure may reveal giraffes, wildebeests, elephants and much more on morning and afternoon game drives through the boundless Serengeti, home of one of the largest wildlife populations in the world. Keep your camera at the ready for a flash of cheetahs, herd of buffalo or pride of lions. 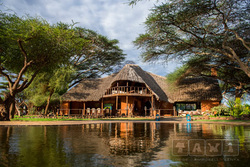 Here, too, reside over 500 species of birds, among them eagles, who glide effortlessly above the sun-soaked landscape. 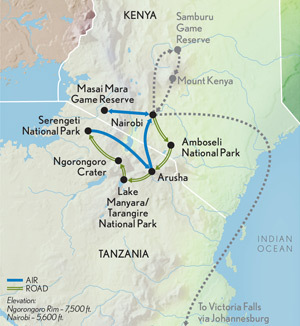 Fly to the Masai Mara via Arusha and Nairobi. After settling into your lodge or tented accommodations within the Masai Mara, the northern extension of the Serengeti, immerse yourself in the wild during an afternoon game drive. Follow the Mara River to see crocodiles bask in the sun; hippos as they wallow in muddy water; and monkeys, busy sparking mischief overhead. Join fellow guests for cocktails, followed by an elegant, informative dinner highlighting the days ahead. Spend two full days exploring the open savanna, woodlands and tree-fringed rivers of the Masai Mara, where patience is rewarded with unique sightings: leopards, who retrieve kills from acacia branches high above, or elephants protecting their young from opportunistic lions. Game viewing is never dull in the Mara, especially when the dramatic, annual Great Migration unfolds. Keep your eyes trained for elephant, zebra and lion sightings as well as a variety of gazelle species. Amid stunning scenery and inspiring wildlife, see Maasai tribesmen traverse the plains or herd goats and cattle. 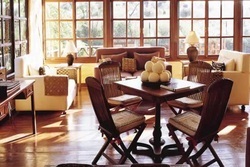 Fly back to Nairobi and spend the afternoon at leisure in a comfortable day room. 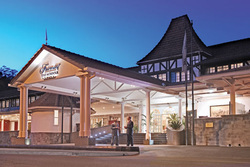 In the evening, transfer to the airport for your departure flight or begin a Post-Tour Extension in Victoria Falls. Available on the Jan 11, Feb 1, Feb 22, Mar 15, Jun 12, Jul 24, Aug 14, Sep 4, Oct 2 and Dec 14 departures. Available on the Jan 11, Feb 1, Feb 22, Mar 15, Jun 12, Jul 24, Aug 14, Sep 4, Oct 2, and Dec 14 departures.